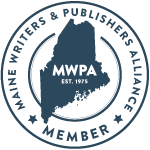 A book club at a pub? Only in North London! 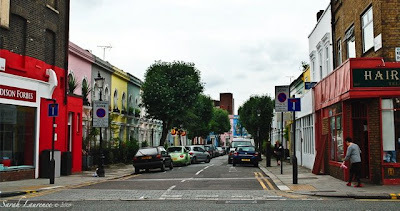 I was in Kentish Town last month doing research for my novel, NOT CRICKET (A MATCH FOR EVE). Two of my (fictional) characters grew up in this neighborhood. I had to visit the local boozer. I was impressed to find them reading Man Booker Prize literary fiction. 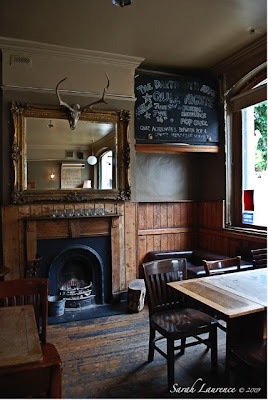 Look inside the Dartmouth Arms. Can you imagine curling up on that leather armchair before the fire with a pint of Adnams in one hand and a novel in the other? Bliss. I could hear my characters talking to me. How did I find this gem? My husband once lived in this neighborhood. He rented the garden flat in the house with the purple door. Years ago we had gone back to visit, and the memory stayed with me. When I pictured my imaginary families living side-by-side in North London, this was the image that came to mind. The Kentish Delight Wine Bar (above) looks new, but most of the neighborhood hadn’t changed much in two decades. This is not a posh part of London, but it’s affordable. The high street features row shops selling: greasy kebabs, fish and chips, discount electronics, Middle Eastern carpets, polyester clothing, flimsy furniture etc. North London hosts an ethnic mix and plenty of bohemian intellectuals and artists, like my characters. 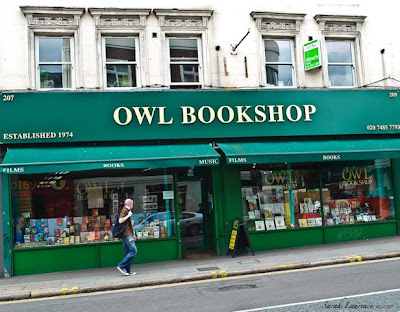 The Owl Bookshop has been on the Kentish Town Road since the 1970s. This well-stocked independent bookshop is worth a trip on its own. Maybe one of my characters could own it. I'm browsing. The low-rise neighborhood has a timeless, gritty quality to it. This isn’t touristy London. You can imagine having a relationship with the butcher (if you weren’t a Vegan) instead of grabbing cellophaned packages. One change was a butcher advertising “organic” meat and fish. Probably the same stuff, just updated marketing. For fun you’d go hear the latest indie rock live. 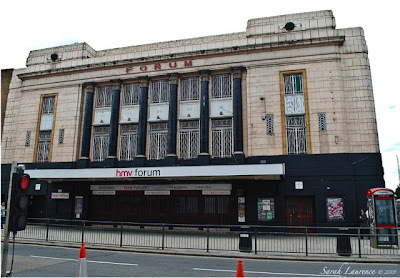 Back in the 1980s the hmv forum was the Town and Country. My husband saw Stiff Little Fingers play there. There has been only a touch of yuppification. 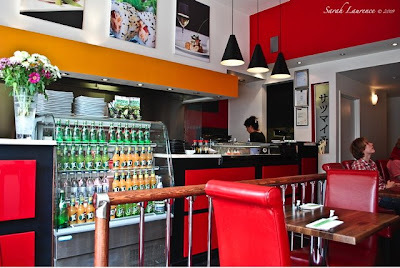 I have to admit to enjoying this new addition: Satuma Japanese Restaurant. It was a trip down memory lane for my husband. He was a wonderful guide. In order to know characters, I walk the streets of their childhood. I won’t include the entire back story, but I want to understand it. Welcome back and I hope you had a great vacation! Thank-You for sharing your pictures of North London--some of the pictures reminds me of the older part of Greenville SC (downtown). I look foward to more pictures in future postings. What a great tour to do research for you book. This is surely the fun kind of research-not the kind where you are glued to a computer like I always find myself. I hope your summer is going great! When we are in England we often stay with a friend in Kentishtown. He lives on Castlehaven Road. I have blogged about it pretty often last summer in June and in March this year, I think. Yes, I wish there were book clubs in pubs here....and with lots of people reading Mann Booker books etc. I hope your research went well. Oh, I wish they could count me in for that book club meeting! The perfect place to have it. And I have been wanting to read The Gathering anyway. Sigh. Tracy, it was a good vacation, but I’m also happy to be back home, catching up with everyone. I haven’t been to South Carolina, but you make me want to visit. Tina, these working vacations in England are the best. I do a lot of research online too, but the most colorful material comes from real life. So far my summer is off to a good start. Elizabeth, how fun to spot another intersection in our lives. Thanks for the link - it was helpful to see inside other houses in that neighborhood. You have such a good eye for detail. Others can go to Elizabeth’s blog and click on the London label. Pamela, if only we could have gone together! Great way to get into the ambience of a place. Thanks for the photos. I enjoyed looking at them. Lakeviewer, ambiance was indeed what I was searching for. Phillip, yes, you would love the gardens and architecture of England. Your research looks a lot more fun than spending time in a dusty library or seeing what you can find on line. Good luck in the process. What a fab description of a place near which I used to work. Kentish Town (pronounced 'kennish' by the locals) is a backwater to the more affluent and middle class West Hampstead to where I commuted every day for five and a half years. 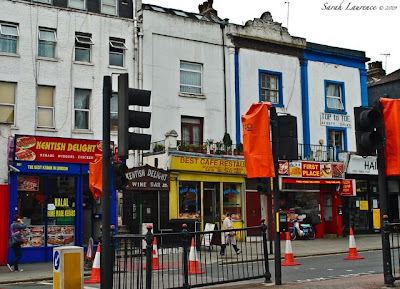 Whereas Kentish Town is second fiddle to West End Lane, Cricklewood is the slum. And let's not forget Willesden Green. You're right, yuppification is not rife in Kentish Town and may it remain so. It has a lot of character this area, it does. Your visit to the local boozer brought back memories of Friday evenings going with the staff to the local pub, although I have to admit to not being a pub person per se; I'm teetotal. You will probably be aware that another novel took NW London as its backdrop, 'White Teeth' by Zadie Smith. Although Zadie focused more on Golders Green, West Hampstead and Cricklewood. Kentish Town also has a very good local set of dance studios, Expressions Studios. Many thanks for this fantastic post and commentary. I really appreciated it. Hi Sarah, this was fascinating stuff, seeing the research of your characters and all, including your husbands old haunts. This all seems very *real* as opposed to the shots of London normally shown in magazines and on the blogs. The Pub was great too. Fun that folks enjoy and review good books with a drink or two. Lovely photographs, they really grab!! Not Cricket will make an interesting read for sure. What a pleasure to see London like this away from all the touristy venues (which is all I have ever seen) Now if I could only find a "literary bar" here, life would be perfect. Fat chance though! Les, I love libraries but walking the streets and hanging out at pub doesn’t feel like work at all. ACIL, thanks for the extra info. This is really helpful. I especially liked the “kennish” detail. I started reading Zadie Smith’s White Teeth years ago but didn’t finish it. It was well written and observed, but I found the characters too depressed and nasty. I enjoyed her On Beauty, especially her depiction of race relations in the US vs. UK. She is an interesting writer. Mama Shujaa, I’m certainly enjoying the research for NOT CRICKET. Troutbirder, ha! a literary bar. I almost never go to a bar in the US, but even families with kids (not drinking!) are welcome at pubs. They are more of a neighborhood hang out. First, I love that your characters talk to you! And I was thinking the same thing about your photos when you said "This isn't touristy London". It's good to see the neighbourhoods too. I always enjoy touring the places that you've visited, Sarah. Even if I were to visit London again--which I hope to do!--I probably wouldn't get to see this neighborhood. As a tourist, you're never quite sure if a place is a "safe" place to be, and yet then you miss out on so many interesting places and people. I like to get away from all the "touristy" places when I can. 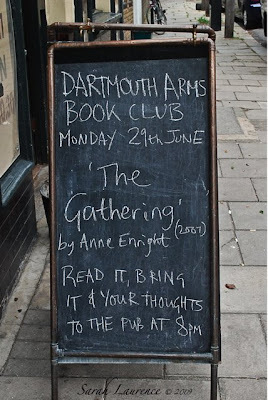 A book club meeting in a pub sounds like so much fun! Welcome home! JAPRA, so I’m not insane? There are two Londons. 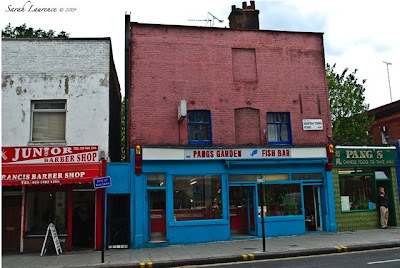 Rose, London, despite its classic beauty and good manners, is not a very safe city. 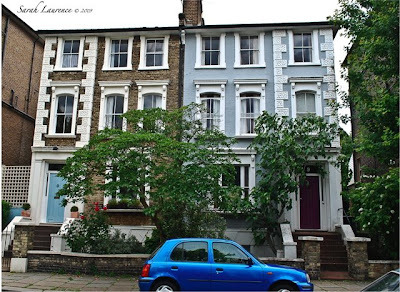 When we were living in North London in 2004, our house was broken into in the early morning as we slept. They got documents, cash and my laptop but luckily not my back ups. When I complained to other Londoners, they all had similar experiences to report. Teenaged boys are often mugged for their mobile phones. At least guns are rare in England. I usually feel pretty safe, but I avoid certain neighborhoods on my own as a woman. Even in the touristy places, you should watch your wallet. I had mine picked at Paddington Station when I was much younger. I hope London gets better about petty crime like NYC has in recent years. There is still nothing bad enough to keep me away from visiting London. It is nice to be home, but even in my “safe” small town there was an attempted burglary across the road while I was gone. Having grown up in NYC, I always lock up when leaving my house even for a short time. Welcome back to Maine - the weather is somewhat improved, don't you think? Your pictures evoke such an image of London. I'd love to be hanging out at pubs and perusing bookstores in England - great work if you can get it! 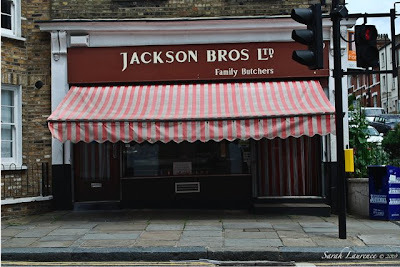 I grew up in a town where you had a relationship with the butcher (I think this may have been before vegans had been invented) and it's one of the things I miss. Book club at a pub? Yep, even though I don't drink, I see the sense in that! Mary Ellen, I write about what I love. When I lived in London back in the late 80’s, the butcher would ask “how was your vacation?” if she hadn’t seen me in a week. I’m actually not much of meat eater (my husband is,) but I really liked her and all the small local shops. Delwyn, I enjoy your anecdotes from the antipodes too. The world seems smaller for blogs and books. What a delight when you stumble on something as unexpected as your book club in a pub - and it makes excellent blog material, too! My husband was teaching a summer course, Spanish for US students, and the dorm had a broken elevator (hurricane casualty ...that wasn't fixed)they were staying in was on the 13th floor. Needless to say, the program did not continue the following semester!!! The yuppified street looks great to me...colorful. I want to check out that book shop in a sec. Imagine having a book club meeting in a pub. It sure supports the idea that books are still viable! Your research in North London must have been fun for both you and your husband. I haven't been to London since I was 11, and I mainly saw Surry, where our friends lived, and touristy things like Mme. Tussaud's Wax Museum. Time to return! Just stumbled onto your blog--enjoyed the lovely pictures and updates on London and Oxford (especially the picture of Blackwell's--my favorite hangout). I'm writing a novel set in Oxford's Bodleian Library and am in awe of your spending a year there! I was there for 3 weeks and the rest of my research has been online. Looking forward to reading Not Cricket. Dave, my thoughts exactly. It’s fun to share. Cynthia, I like how you project your family into the house. My husband only lived on one floor. I loved the purple door too and the painted facades. Perhaps they should have renamed the language program: Fitness and Spanish. Charlotte, yes, you are due to return to England. I hadn’t realized it had been so long. Joan, welcome to my blog! I loved the Bod. It sounds like a lovely setting for a novel, although the dialogue might have to be in whispers. Thanks for the encouragement to finish writing NOT CRICKET. Thanks for checking out my blog. Great to connect with you, too! A lot of whispers, a few ghosts, and a bank holiday weekend. LOVED seeing the pictures and hearing the stories to go with them! All, I’ll be posting on Wednesday (July 22) but later in the day than usual. What a great tour of North London. I NEED to visit the Owl Bookshop. I'll have to start plotting my next visit to London soon! 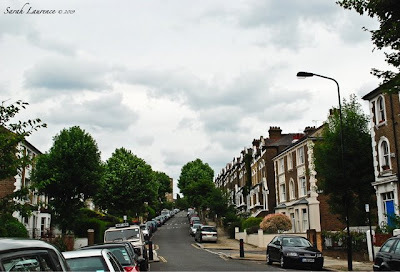 I've never been to Kentish Town, so this post provided a very good introduction! I wonder what the book club made of The Gathering? (I couldn't really get into it.) I think the house with the purple door looks absolutely delightful, and I'm so glad your characters will be "at home" now. Shauna, you’d love the bookstores in London. Bee, I haven’t read the Gathering myself, but I heard it was dense reading. London was indeed inspirational. It is rather interesting for me to read that blog. Thanx for it. I like such themes and anything connected to them. I definitely want to read more on that blog soon.